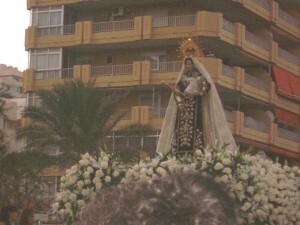 You are here: Home › The “Virgen del Carmen” Procession in Los Boliches: Amazing! On Friday evening, I decided to follow the advice I gave on my blog post about the Virgen del Carmen Celebrations and took my family to see the processions in Los Boliches, Fuengirola. Unlike some of the other towns, the procession in Los Boliches is well known for starting late in the evening; it actually goes on until well after midnight. 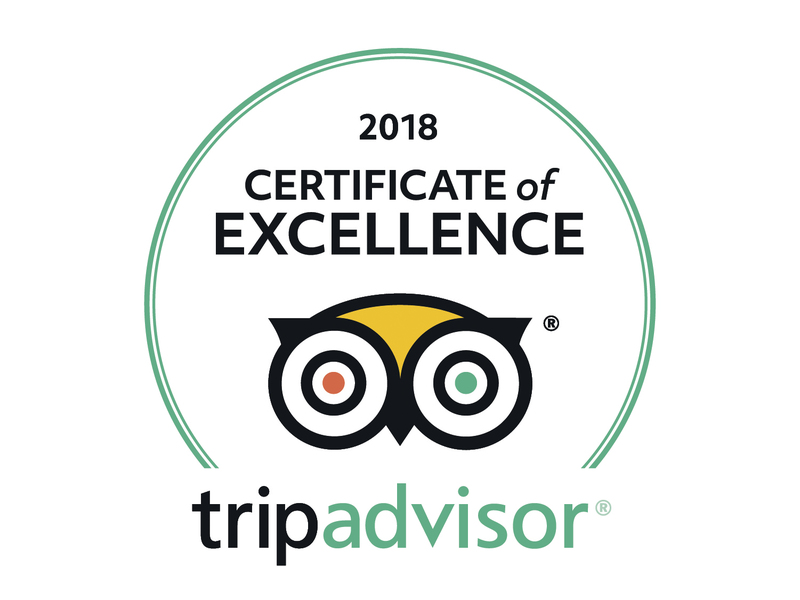 As we arrived early – well early by Spanish standards – we decided to stop off in one of the “chiringuitos” on the beach and enjoy a little “pescaito frito”; calamares, boquerones, prawns and a couple of cold beers! We were now ready to go and see the “Stella Maris”. I have been to other “Virgen del Carmen” processions in other towns, but this was my first time in Los Boliches; I couldn’t believe the amount of people that turned up to the promenade to watch…. We are talking thousands! The procession started in the church and made its way down to the paseo maritimo (promenade) where thousands of families watched and cheered as the local fishermen carried the “Virgen” into the sea and onto one of the fishing boats that awaited. Dozens of boats – large and small – were waiting near the shore lighting up the sky with their colourful displays. 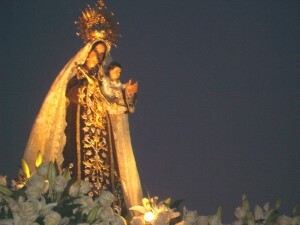 There were people swimming and parents – me included – lifting their children on to their shoulders so that they could take a peek at the image of the Virgen and shout “Guapa” , “Guapa”. It’s hard to explain in words, but take my word for it, it was an incredible site! The spectacle ended with what is probably one of the best fireworks displays I have seen on the Costa del Sol; truly breathtaking. A great evening spent with the family and one I will certainly be repeating next year.